I just can't stress enough how important it is to perform GSD socialization and training activities early, and often, in your German Shepherd’s life. Go to the park, to as many dog-friendly stores as possible, take your dog on errands with you, go on car rides together, etc. Take your German Shepherd puppy with you wherever and whenever you can. And when I say take the GSD puppy with you, I mean take it in with you - do not leave it in the car while you're in the store. German Shepherd socialization will occur whenever your puppy is introduced to new situations, new people and animals, and new places. They need to actively participate in socialization for it to really work - that means you must let them safely interact with new people, places and things. This is definitely a great step in building the German Shepherd puppies confidence and building a much more stable temperament - making it more capable of coping with new and unusual experiences. German Shepherds are highly intelligent and these early GSD socialization lessons, being around new and different stimuli, will make your adult German Shepherd much more stable and confident - and this is exactly what you want. Your new German Shepherd puppy has spent the first few weeks of it's life with his mother, litter mates and breeders family. Additionally your new GSD puppy may have gone on rides to many new places such as the veterinarian, short shopping errands, and on short training rides - these are all GSD socialization experiences. It has probably heard many different kinds of noises: people, horns of cars, birds chirping, children, sounds of traffic, etc. If your German Shepherd puppy was raised in a farm type locale the puppy has probably seen, heard and smelled many different types of animals, larger farm equipment, etc. Other interesting things to introduce your puppy to are: slick floors (tile / linoleum), elevators, stairs and carpeting. One of your new jobs as the German Shepherd puppy's new owner is to add to all of those past experiences with many other new ones. Ask the breeder what kind of socialization has been done with your puppy and take it from there. The more new and exciting experiences that your make your German Shepherd a part of, the better. I can't stress enough how important it is that you continue to socialize your GSD puppy during the first several months of its life and from then on. Discovery of new experiences and teaching the puppy to deal with them positively and confidently is highly important to its development. Many studies have been done that show the critical socialization period for a puppy is from eight to sixteen weeks of life. During this period it is essential that the German Shepherd puppy safely and positively experience as many new things as possible. Some of these experiences will be a little stressful, but you must support your puppy during these times and encourage them throughout the entire critical GSD socialization process. 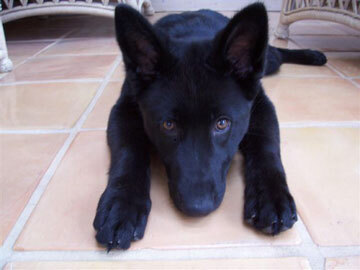 Here's a short example of how simple this GSD Socialization process can be: Several years ago I was walking my 10 wk old GSD puppy, Cera, around our block on one windy day. Out of nowhere a small piece of trash paper blew by both of us, quietly startling her. She watched the trash as it continued to blow up against the curb, changed direction and blew closer toward us. Curious, she wanted to check out the new object that was moving around on the curb in front of us and now moving toward us but unsure as how exactly to react to the new object. It was obvious to me that she was curious enough to want to check it out, but also fearful enough that she wanted to run away from it. I waited to see what she would do. She watched the object as it moved around, sometimes backing up slightly, sometimes moving toward it. I allowed her the time to observe the paper and waited to see exactly what she was going to do about it. It seemed longer, but I'm sure that it was only a few minutes until she decided to slowly approach that piece of trash paper. What a brave girl. Eventually she pounced on the paper and give it a good shake and chewing before I finally took it away from her! I praised her profusely. Not for tearing up the paper but more importantly for approaching it after her initial fear response. She met her fear of this new and strange object face to face and overcame it. In future experiences with new and strange objects she would now be more confident. Over time and with more and more positive experiences like this one, Cera grew up to be a very emotionally strong, good-tempered and confident GSD. 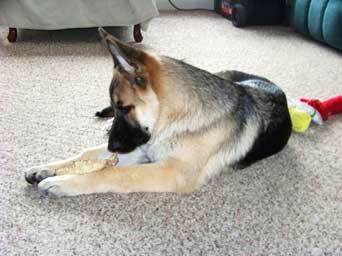 As the owner you play a major role in providing this confidence for your new German Shepherd puppy. 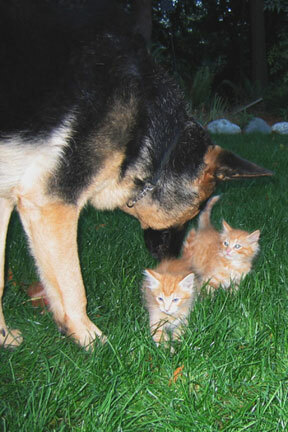 It is extremely important to socialize your German Shepherd starting at as young an age as possible to make them more comfortable with other people and dogs and able to feel comfortable and confident in strange environments. It can really come in handy when meeting new people or maybe even meeting your new baby. Puppy obedience classes, also referred to as Puppy Kindergarten, are an incredible means to introduce your puppy to the world outside of your home. 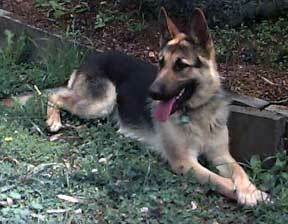 This is both a prime GSD socialization experience as well as a wonderful training and bonding opportunity. Puppy obedience training classes are set up in such a way as to teach the German Shepherd puppy the actual commands, but also to teach you, the owner, how to train the puppy very specific behaviors and manners, now and in the future. Your dog will quickly discover the link between your commands and the desired behavior. It is entirely possible that you can train a GSD puppy at home as well but compared to all the great GSD socialization lessons your German Shepherd puppy can gain from the puppy classes, there really is no comparison. In fact, I highly recommend them.